monochrome to deliver a 2x increase in responsivity, as well as bilinear, trilinear, and quadlinear color designs to maximize color performance. Large full-well capacity maximizes signal coverage for bright light, while low read noise ensures superior signal-to-noise at low light. Our CMOS image sensors’ high dynamic range, combined with on-chip ADC for high speed, gives the Piranha4 cameras unprecedented performance. 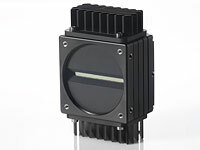 Machine vision performance requirements always increase. Over the last decade, feature sizes in applications such as semiconductor wafer inspection have shrunk by a factor of 3.3 in each dimension (~10.8x overall), while wafer areas have grown by a factor of 2.25 (from 200 mm to 300 mm lines) even though wafer throughputs in wafers per hour have remained the same. Measured as the product of speed and resolution, performance has increased by roughly a factor of 25. Nowhere are these demands stronger than in linescan imaging, where integration times are mere microseconds and budget and safety concerns limit the available light. Through hard work, careful pixel design and process development, sensor designers have delivered steady progress in amplifier bandwidth for greater speed, even as they reduced amplifier noise. They have also boosted sensitivity, both by improvements in basic charge conversion efficiency (CCE) and in pixel architecture (for example, in-pixel amplifiers for CMOS devices). But as images are formed from fewer and fewer photons, conventional designs approach fundamental limits. In high-speed, low-light situations, photon shot noise is becoming a limiter to image quality. Photon shot noise is a statistical phenomenon following a Poisson distribution resulting from the random variation in the number of discrete photons striking the photosensor. Unlike reset noise (which can be corrected by correlated double sampling), or various forms of fixed pattern noise (deterministically corrected by subtraction or addition), photon shot noise cannot be electronically or algorithmically corrected. Arising from the quantum nature of light, photon shot noise cannot be separated from the signal itself. And because it scales sublinearly with the collected charge, it becomes a progressively more dominant noise source as the available light decreases (e.g. halving the number of photons only reduces the shot noise by 1-1/v2 or ~30%). In low-light applications, photon shot noise will eventually limit the sensor and camera noise floors. Teledyne DALSA’s novel dual linescan CCD breaks this trend. By doubling sensitivity with only a v2 increase in shot noise, the design delivers a greater signal to noise ratio, especially in light-starved situations. Functionally similar to TDI arrays, the design consists of two parallel arrays of photodiode pixels. Each pixel is connected to a selectable delay gate that either allows charges through or delays the charges by one scan line. Signal electrons from the two arrays (one of which has been delayed) are then combined on-chip into a single output (with no increase in amplifier noise). Because the delay is selectable, the sensor allows bidirectional scanning. The design also preserves powerful conventional linescan features such as exposure control and high blue response. The main disadvantage of this design is an increase in dark signal from the doubled pixel area. But for high-speed applications (as most linescan applications are), the integration time is so short that the dark signal remains negligible. Proof of the design’s high-speed low-light effectiveness can be found in Teledyne DALSA’s Spyder3 linescan cameras. 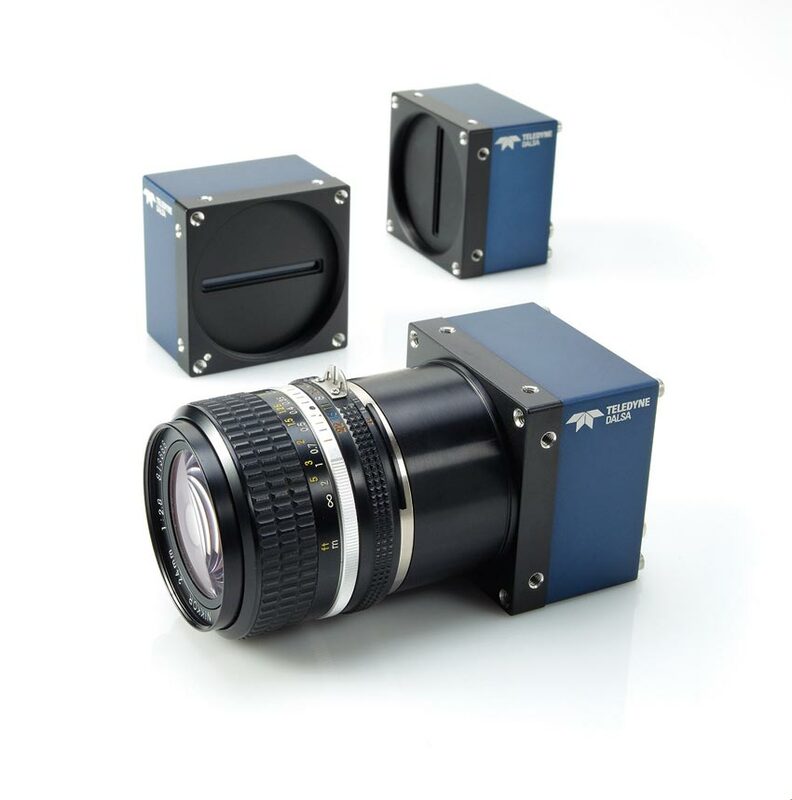 With dual-linescan and improved CCE, these cameras deliver three times the responsivity and twice the line rates of their predecessor. Spyder3 also offers a gigabit Ethernet interface, which allows 100 meter cable lengths (longer with repeaters) and can significantly reduce total system costs. Machine vision’s appetite for speed, sensitivity, and low noise will only increase, and those goals will only become more difficult to reconcile. 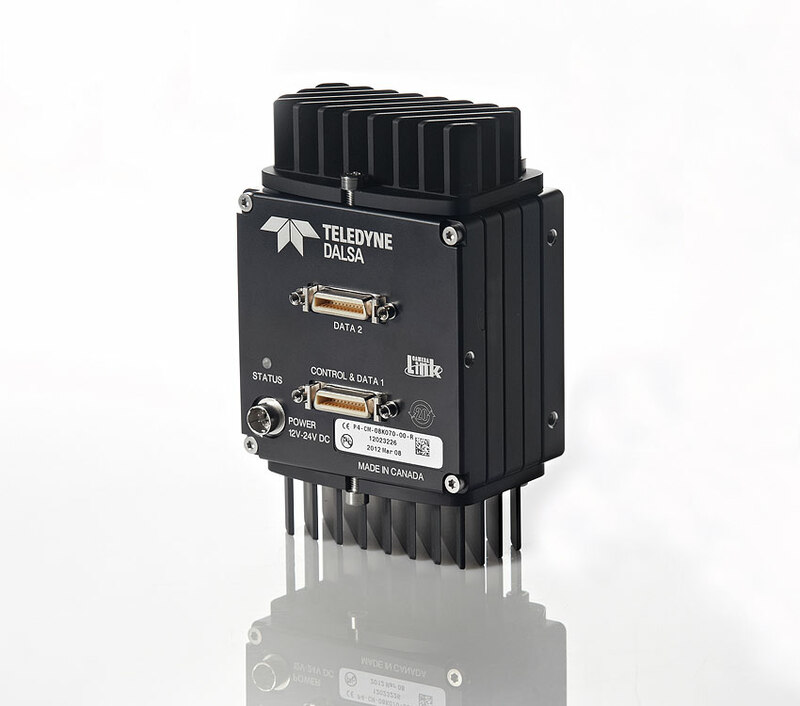 Teledyne DALSA’s dual-linescan design is an innovative solution to high-speed low-light challenges.